Venus most likely would have died if not for Hope For Paws. In 100+ degree weather, the animal was in serious danger in the middle of the desert, and was resorting to drinking muddy water off the side of the road to survive. Responding to a call about this difficult situation, the people behind the Hope For Paws organization teamed up with the Coastal German Shepherd Rescue and Dr. Scott Amsel, animal expert, to rescue Venus (video below). 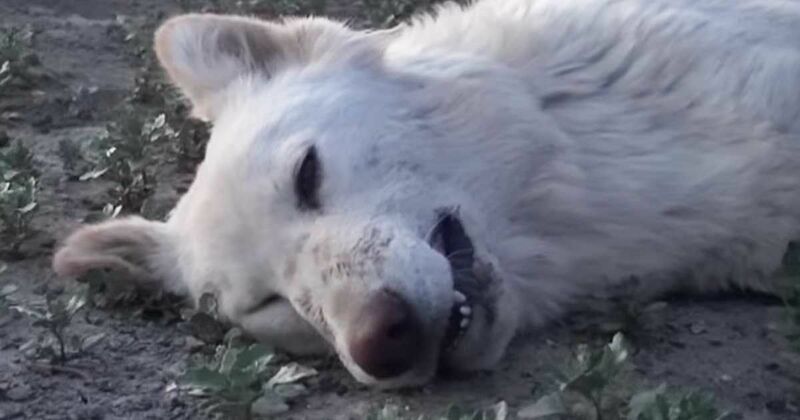 Because she was highly fearful, refused to be approached, and had no dead ends to get trapped in – a recurring strategy of the organization's – the White German Shepherd had evaded every gentle rescue attempt thrown her way. Dr. Amsel had no choice but to tranquilize her with a dart. Because they had to be careful not to let the dog run off into traffic after shooting her, the crew stood by for several hours, waiting for a strategic position to dart her with. Once the dog was shot, it was very important for the crew to go after her as fast as possible. "If the dog manages to disappear, the result would be certain death," explains Eldad Hagar in a Facebook post. Venus is now happy and healthy, the white luster of her fur restored in full. But less than 24 hours after Eldad's Facebook post celebrating the rescue went up, he and his organization were approached by another urgent cry for help. A good Samaritan's job is never done. Make sure to share this sweet rescue with your friends on Facebook. Abandoned pit bull mix found in Massachusetts finally rescued and sent on journey to foster home in New Jersey. Apollo the pit bull was found in a Houston, TX construction dump site with half his face missing. Cinnamon was found in an abandoned apartment tied so tightly to a radiator, rescuers had to cut her leash off.